Openness: All advantages of Open Source are a result of its openness. Having the code makes it easy to resolve problems (by yourself or the next guy) which means that you don't have to rely on only one vendor for fixing potential problems. Stability: Since you can rely on anyone and since the license states that any modification shipped elsewhere should be equally open, this means that after a period of time Open Source software is more stable then most commercially distributed software. Adaptability: Open Source software means Open Standards, thus it is easy to adapt software to work closely with other Open Source software and even closed protocols and proprietary applications. This solves vendor lock-in situations which ties your hands and knees to one and only one vendor if you choose one's products. Quality: A wide community of users and developers does not only ensure stability, but also supplies new possibilities, making Open Source software a feature-rich solution. New features, less bugs and a broader (testing) audience (peer-review) are significant to the quality of a product. Innovation: Competition drives innovation and Open Source keeps competition alive. As no-one has an unfair advantage, everybody has the possibility to add value and provide services. Information wants to be free. Security: It is widely known that security by obscurity is not a secure practice in the long run. By opening the code and by wide adoption of Open Source software, it grows more secure. The TCExam project is managed and distributed trough the GitHUb repository. The community support is an important part of the TCExam development process. TCExam is in continuing development to reflect the real needs of the users and improve all aspects of the software quality. TCExam is a Web-based application developed on the popular LAMP platform (GNU-Linux Operative System, Apache Web server, MySQL Database Management System and PHP programming language). Part of TCExam's attraction is that it can be installed on almost any server that can run PHP, including Unix, Solaris, Mac OS X and Windows systems. The database is fully documented to be easily extended or accessed by external applications. In addition, PostgreSQL can be used instead of MySQL and it is also possible to add drivers for other DBMS. No additional commercial or expensive software is required to run TCExam. This gives TCExam great installation flexibility in existing environments (i.e. a PC on a school computer room or a commercial remote Web-Server). TCExam uses a common Three-Tier structure. Administration and public areas are physically separated on file system to improve security. As a Web-based application, TCExam runs on a Web server and uses Web pages as the user interface. For users, all TCExam requires is a computer or PDA with a Web browser (i.e. 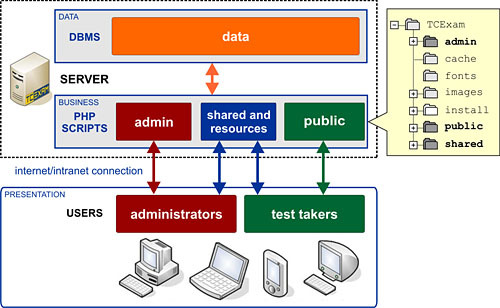 Mozilla Firefox or Internet Explorer) and an Internet or Intranet connection to the TCExam Web server. No additional software or specific hardware is required to use TCExam. The LAMP platform and the flexible technical requirements make it possible to install TCExam on almost any computer and even run it on shared Web servers managed by Web hosting providers. Experimental results shows that a five years old PC, based on AMD Athlon XP 2400+ processor, 1GB RAM and a 100Mbps Ethernet card, may easily handle 50 tests at the same time. This feature is particularly important to gap the digital divide with developing countries or rural areas, where modern hardware is unavailable or too expensive. TCExam is language independent by adopting the UTF-8 Unicode charset and TMX (Translation Memory eXchange) standard. TMX (Translation Memory eXchange) is the vendor-neutral open XML standard for the exchange of Translation Memory (TM) data created by Computer Aided Translation (CAT) and localization tools. The purpose of TMX is to allow easier exchange of translation memory data between tools and/or translation vendors with little or no loss of critical data during the process. All TCExam translations are included in a single XML file that could be easily edited manually or with a dedicated CAT tool. In this way everyone may download TCExam and add a new language translation without waiting the next software release. TCExam supports Right-To-Left languages (i.e. Arabic, Hebrew, Persian) and already includes translations in several languages. The users may change the interface language at any time by using the selector at the end of each page. It is essential that CBA tools be accessible in order to provide equal access and equal opportunity to people with disabilities. TCExam generates Web interfaces that conform to the XHTML 1.0 Strict standard and W3C-WAI-WCAG 1.0 Accessibility and Usability guidelines. The graphic aspect of the user's interfaces is fully handled by CSS level 2 style sheets. CSS benefits accessibility primarily by separating document structure from presentation. Style sheets were designed to allow precise control - outside of mark-up - of character spacing, text alignment, object position on the page, audio and speech output, font characteristics, etc. Accessibility means that people with disabilities can use the TCExam. More specifically, means that people with disabilities can perceive, understand, navigate, and interact with the TCExam software. Accessibility also benefits others, including people with "temporary disabilities" such as a broken arm, and people with changing abilities due to aging. Web accessibility encompasses all disabilities that affect access to the Web, including visual, auditory, physical, speech, cognitive, and neurological disabilities. Web accessibility also benefits people without disabilities in certain situations, such as people using a slow Internet connection. Ease of learning - How fast can a user who has never seen the user interface before learn it sufficiently well to accomplish basic tasks? Efficiency of use - Once an experienced user has learned to use the system, how fast can he or she accomplish tasks? Memorability - If a user has used the system before, can he or she remember enough to use it effectively the next time or does the user have to start over again learning everything? Error frequency and severity - How often do users make errors while using the system, how serious are these errors, and how do users recover from these errors? Subjective satisfaction - How much does the user like using the system? TCExam has been successfully tuned to be easily used by blind users. To improve the software flexibility and compatibility with other CBA software, e-learning applications or existing databases, TCExam includes some tools to directly export or import users, questions or results data using various open formats: CSV (Comma Separated Values), XML (eXtensible Mark-up Language) and PDF (Portable Document Format). The detailed results in PDF format can be automatically sent by email to each user. In addition, the database is fully documented in order to make it easily accessible by external applications (i.e. phpMyAdmin) to perform custom data import/export or backup procedures. The current TCExam version includes RADIUS (Remote Authentication Dial In User Service), LDAP (Lightweight Directory Access Protocol) and CAS (Central Authentication Service) modules, to directly access existing large database of users. Other authentication modules can be easily added to TCExam to meet specific needs. 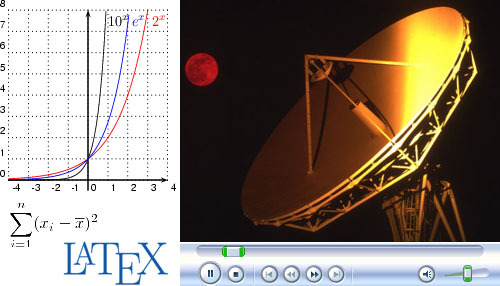 TCExam uses a common mark-up language to add text formatting, images, multimedia objects (audio and video) and mathematical formulas (supports LaTeX). TCExam includes a simple graphic interface with buttons to easily format the text or add external objects (i.e. images, audio files, videos, flash animations, etc ...). Generally, any object that could be rendered with a Web browser using a specific plug-in can be added to the TCExam questions, alternative answers or general descriptions. 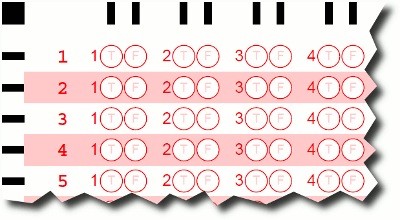 The mark-up language used by TCExam is similar to the common BBCode (Bulletin Board Code), the lightweight mark-up language used to format posts in many message boards. The available tags are indicated by rectangular brackets surrounding a keyword, and they are parsed by the TCExam system before being translated into a XHTML or PDF. The TCExam mark-up code was devised to provide a safer, easier and more limited way of allowing users to format their content. Using the special tag "[tex]" or TEX button it's possible to add LaTeX code to represent mathematical formulas, tables or graphs. LaTeX is a document preparation system for high-quality typesetting. It is most often used for medium-to-large technical or scientific documents but it can be used for almost any form of publishing. The TCExam LaTeX renderer converts the code to a PNG image to be displayed or printed. In TCExam, questions are grouped into modules and topics. TCExam can store an unlimited number of modules. Each module can contain an unlimited number of topics. Each topic can contain an unlimited number of questions and each question can have an unlimited number of alternative answers. A TCExam test can include several modules and topics. For each module, topic or groups of modules/topics, TCExam randomly extracts a specified number of questions with certain characteristics (i.e. : question type, question difficulty and number of alternative answers to be displayed). If the question bank is large enough, TCExam may generate unique test for each user by randomly selecting and ordering questions and alternative answers. This drastically reduces or eliminates the risk of copying between users. TCExam can generate printable PDF documents for pen-and-paper testing. The OMR answer sheet can be scanned and uploaded to TCExam for automatic test importing, scoring and reporting.